David Mintz was born in England in 1959. At the age of eleven, he immigrated to Israel. In 1977, he completed his high school studies at Midrashiyat Noam, Pardes Hanna. During the years 1977 and 1982, he served in the Israel Defense Forces as part of the Hesder Yeshiva in Gush Etzion, as an officer in the Armored Corps. In 1986, he completed his LL.B. degree at the Hebrew University of Jerusalem. During his studies, from 1984 to 1985, he served as research assistant to Prof. E. Shochetman and Prof. B. Lifshitz at the Hebrew University of Jerusalem. He then interned with the Honorable Justice Y. Weiss, President of the Jerusalem District Court and at the Supreme Court in 1986. In 1987, he completed another year of internship at a law firm in Jerusalem. The same year, he studied towards rabbinical ordination at the Ariel Institute in Jerusalem and became certified as a lawyer. From 1987 to 1998 he he was an associate and then a partner in an independent law firm. In September 1998 he was appointed judge at the Magistrate's Courts of the Jerusalem District. In 2008, Justice Mintz completed his Master of Laws (LL.M.) degree at the Hebrew University of Jerusalem with honors. In October 2009 he was appointed Registrar and Acting Judge at the Jerusalem District Court. 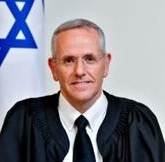 In March 2011, he was appointed judge of the Jerusalem District Court. He also serves as a lecturer on insolvency law at the Hebrew University of Jerusalem. Justice Mintz received his PhD in law from the Hebrew University of Jerusalem in 2017; his thesis was on "The Effect of Bankruptcy proceedings on Third Parties." The same year, in June, he was appointed Supreme Court Justice.